You know I love my bowl recipes. Maybe my next cookbook (I mean if there is a next cookbook…who knows, but fingers crossed) should include all bowl foods. I have no doubt that I can come up with one hundred and fifty solid bowl food recipes. I think they’re my favorite. I am not really sure why, but I just love them. I think maybe it’s the fact that I love bowls in general, especially the pasta style bowls (hmmm, wonder why?) or maybe it’s the fact that I have an excuse to serve everything with an avocado because it seems that everything in a bowl needs to be topped with an avocado. Yup, the avocado thing, that’s probably it. I am semi obsessed with them these days and probably have one a day. My favorite is avocado + flaky sea salt + quinoa. Three ingredients, so simple, so good. Anyway, seeing as my family loves steak, I have been wanting to come up with a fun and different, but still easy, weeknight steak recipe, and this Cuban inspired steak is perfect. Meaning my family loved it, onions and all, YESSS! As you guys know, when I feed my family, I have some picky eaters. They really just want steak and rice, chicken and rice or tacos, the simpler and blander the better. Seriously. Me being me, I’m always trying to get them to branch out a bit from their norm. Not going to lie, my mom went nowhere near this steak due to the onions, but my dad and brother loved it. My dad will eat anything, but my brother is pretty picky. 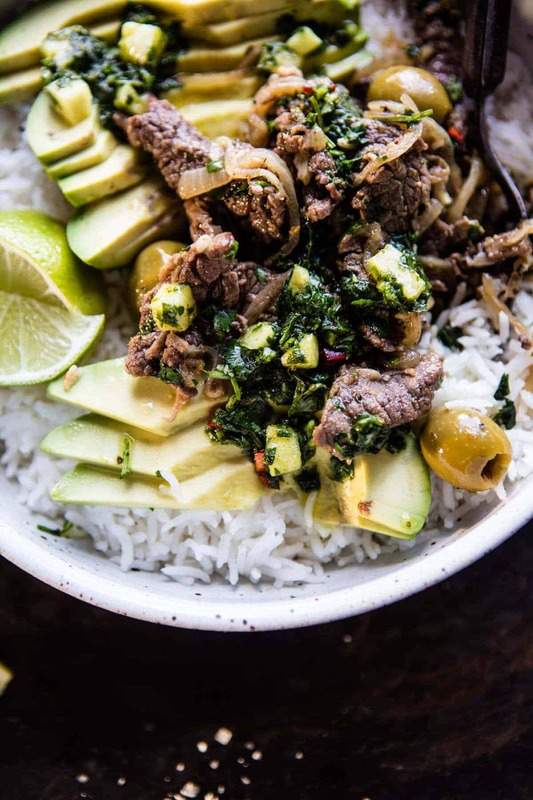 That being said, he has found a new love for caramelized onions, so this steak ended up being right up is alley, but ahh, he totally did not touch the avocado or the chimichurri cause he’s freaking outta his mind. Just sayin’. BUT the steak was a hit, so I guess I’ll take that! I wanted to keep things simple as can be, so I marinated the steak in a little olive oil, garlic, oregano, cumin, and lime juice. From there you cook up some onions, toss in the steak, some olives and done. Simple, but really, really good. My favorite part is the pineapple chimichurri. I was inspired by my recent mango chimichurri to try out a pineapple version and since pineapple is very cuban, I went for it…so. so. so good. I love the sweet and savory combo and pineapple is always such a nice paring with steak. Trust me. 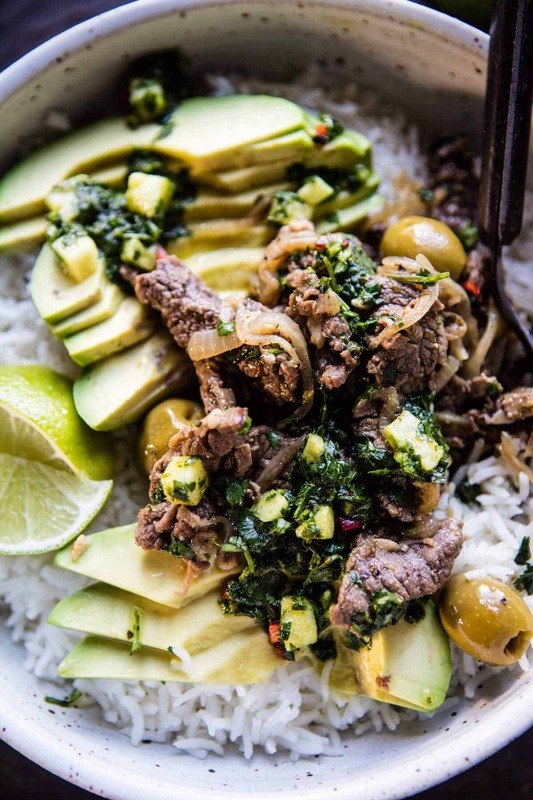 Add the avocado and you have the perfect meal…swap brown rice for white, and this dish will be even healthier. Cool. Cool. The rest of the ingredients are herbs, olive oil and garlic, so pantry staples, right? Hoping so because it has the potential to be the perfect Thursday night dinner. For real. In a bowl, combine the pineapple, cilantro, fresno pepper, garlic, vinegar, olive oil, and lime juice. Keep stored in the fridge for up to 1 week. In a large ziplock bag, combine the steak, olive oil, garlic, oregano, cumin, bay leaves, lime juice, salt and pepper. Seal the bag and toss well to combine. Place in the fridge for 30 minutes or up to over night. Heat a large skillet over high heat. Add 2 tablespoons olive oil and the onions. Season with salt and pepper. Cook, stirring often until softened, about 5 minutes. Add the steak and cook 5-8 minutes or until cooked to your liking. Remove from the heat and stir in the olives. 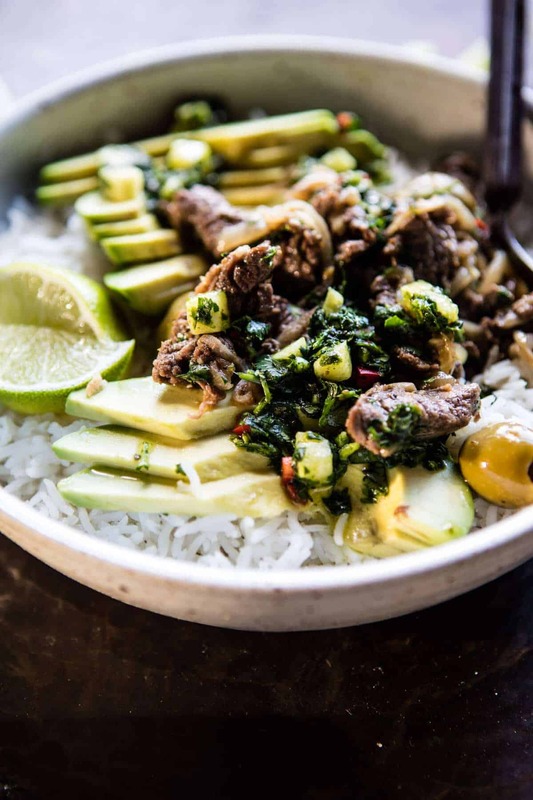 To serve, divide the rice among bowls and top with steak, chimichurri and avocado. enjoy! First though, steak and rice to push us through till Fri-DAYYYYYY! Oh yeah, this looks so good, and it’s got olives too!! I love my latin food. This is my weak spot! Avocado is the best! The meat looks so juicy and delicious with all the aromatic herbs. Oregano & cumin are part of the flavorful Latin cuisine. I like bowl food too!!! Ah yay! Always have the best things to say (: Thanks Carlos! This looks SO darn good! Oh my goodness gracious – yum! Oh my god! 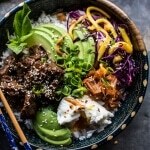 This rice bowl sounds soo amazing. It’d be perfect as a weeknight dinner. And that pineapple chimichurri! I could dive right into this bowl and never come out! I’m obsessed with food bowls, too. I recently bought some gorgeous white serving bowls from Target that I’ve been using for my meals and it’s the best decisions I’ve ever made. I totally decide to make bowls whenever I get new ones! Haha. Thanks so much Ashley hope you love it! 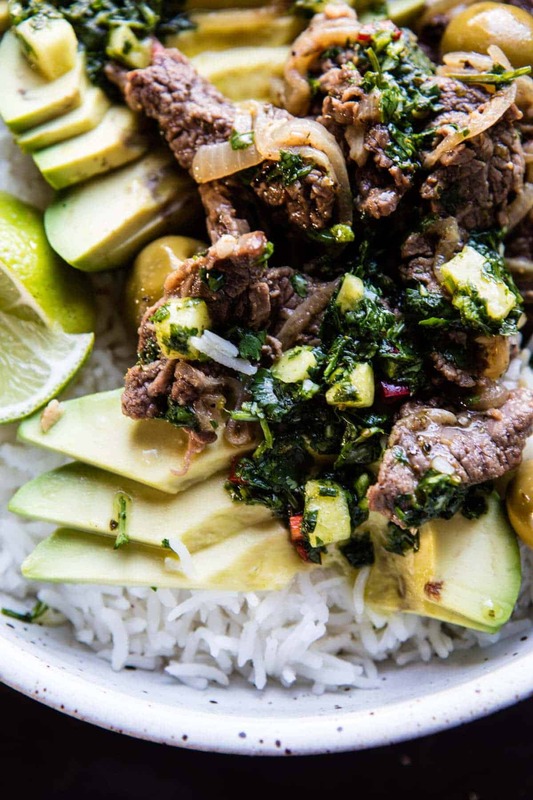 Steak and avocado? YES PLEASE! Add pineapple? EVEN BETTER! 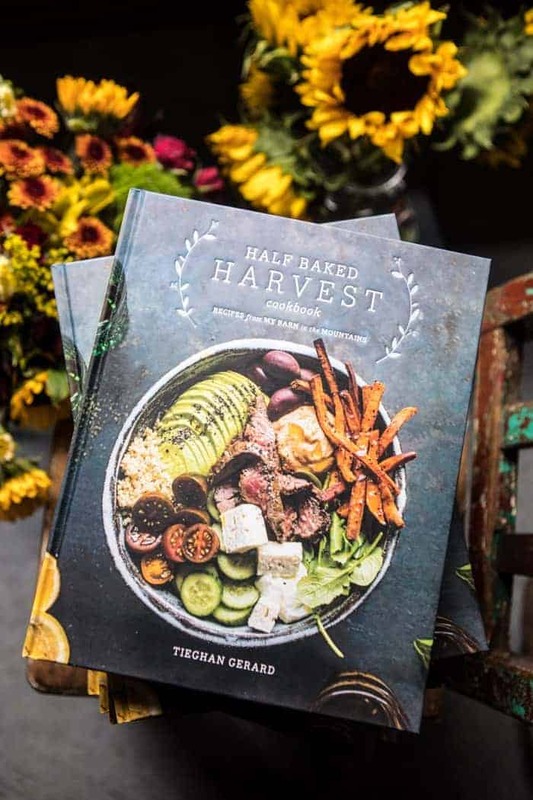 Looks amazing, Tieghan! And for Netflix binges, I just watched the first season of Better Call Saul and can’t wait another month or so for Netflix to release season 2. Also heard this am, that Planet Earth II is being released in the US starting Saturday. Planet Earth I was the most visually stunning series ever, so I can’t wait to see the new episodes. SO happy you are liking it Leah! This recipe would get devoured by my family. I think the pineapple chimichurri is super creative and sounds divine. Also, skirt steak 🙌🏼. Yum yum! This recipe would get devoured by my family. The pineapple is really creative. You have a great sense of balancing flavor! 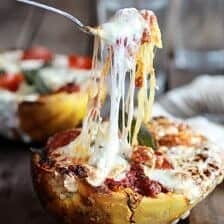 Your idea about a cookbook with nothing but bowls? Yes, please! Avocado & pineapple always win me over! I love skirt steak and find it a good tasty alternative to other more expensive cuts. Question: When you add the steak, do you add the entire contents or just the steak? Hi tracy! Add the entire contents. Sorry if that is confusing. Let me know if you have questions. Hope you love this! 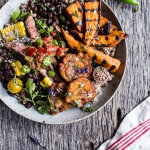 Bowl food is the best and that pineapple chimichurri totally makes this! Yes!! So happy you like it! I was in heaven with this one! Thanks Laura! Currently bingeing The Fall on Netflix. Perfect for a long dreary weekend! Oh sweet! I’ll have to check it out! I’ve heard those are both great! Thanks! Spectacular…. the salsa made the dish! Thanks Larry, so happy you liked it! I binge-watched Santa Clarita Diet the week it came out. So funny! I love funny stuff! I’ll have to try it out thanks! This was super fun and full of awesome flavors. However, the steak was extremely tough and not that easy to chew. Any suggestions for the future? Hi! So happy you enjoyed this! When steak is tough it typically means it’s not the best cut of meat or it is overcooked. did you marinate the steak long? Marinating overnight can help to tenderize the meat. Let me know if you have other questions. Thanks! Such a wonderful recipe! 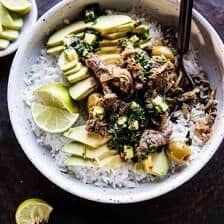 I made one change and highly recommend trying it: make coconut rice instead of white rice to go with the steak. 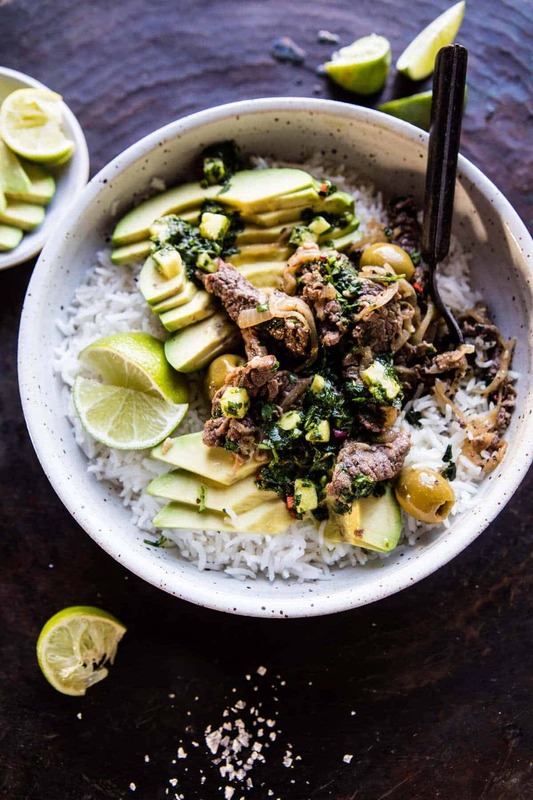 The combination of the sweet coconut rice and the salty steak and olives is SO GOOD. Sounds amazing i’ll have to try it next time! Thanks Tamara! 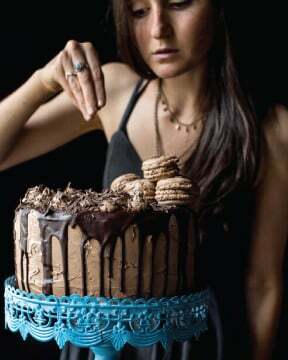 I’m planning to make this tonight. I have so far made 3 of your recipes and I have to say, you have got talent! I made the sage and brown butter mashed potatoes, which has now reopened my mind to mashed potatoes in general. I also made the goat cheese and mushroom pasta last night and WOW! I had my reservations, but I should have known it would have been delicious. Now I’m excited about this recipe! 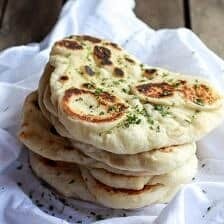 Thank you for posting these amazing recipes! 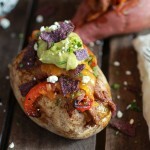 You’re an inspiration in the kitchen and my new favorite food blog! WOW! So happy you liked them all! Hope they keep being delicious! Thanks so so much Tracie! 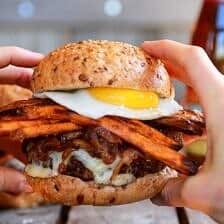 My husband and I have been LOVING all the recipes on this site. 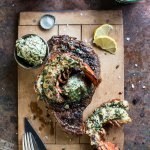 I just found your amazing blog and have cooked so many of these delicious meals the last few weeks. My husband loves Cuban flavors, but likes steak well done. Do you think I could cook the steak in a slow cooker so it would be well done but tender? Any suggestions how to go about it without compromising flavor? hey Rose! Thank you so much, so glad you are enjoying the recipes! 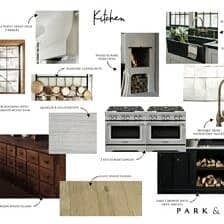 🙂 I think cooking in the slow cooker will be great! I would just add all the ingredients to the slow cooker and cook for 6-7 hours on low. I think that will be great! Let me know if you have questions! Do you think this turn out alright in a crockpot? Very tasty. I want to slice my skirt steak thinner next time. I used Spanish rice. Yum! So glad you enjoyed this Peggy! Thank you! Made tonight and it was delicious! Only change: I grilled the meat. 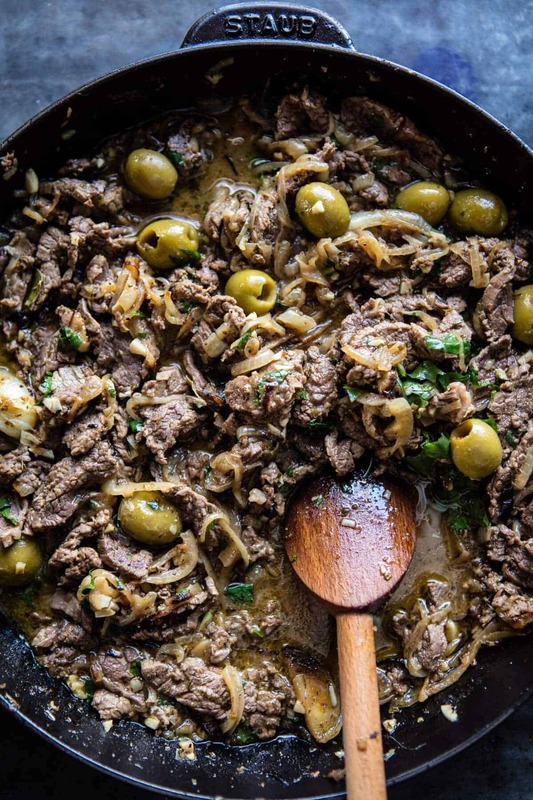 Still did olives and onions in cast iron on stovetop. Pineapple and cilantro chimicurri is a must! Avocado to! Could eat once a week! I am so glad you enjoyed this Melissa! Thank you!